Four weeks ago, Lost in Translation looked at the 1998 adaptation of Godzilla. To summarize the previous review, the 1998 adaptation had a good start, mirroring the original Gojira but fell apart with the monster reached Manhattan. The other issue the adaptation had was that the titular monster didn’t look like the iconic Godzilla. The planned reboot/remake trilogy turned into a short-lived animated series. GINO* wasn’t disavowed, but Toho renamed the monster to “Zilla”. Time passes, as it is wont to do. Godzilla is too iconic to leave fallow. Toho released a Godzilla movie a year from 1999 until 2004, then left the franchise to fallow for a decade. 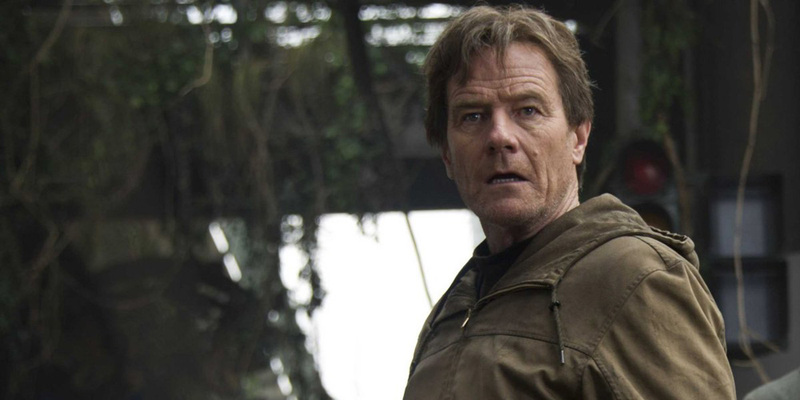 A second wholly American production was started, becoming the 2014 adaptation, Godzilla. 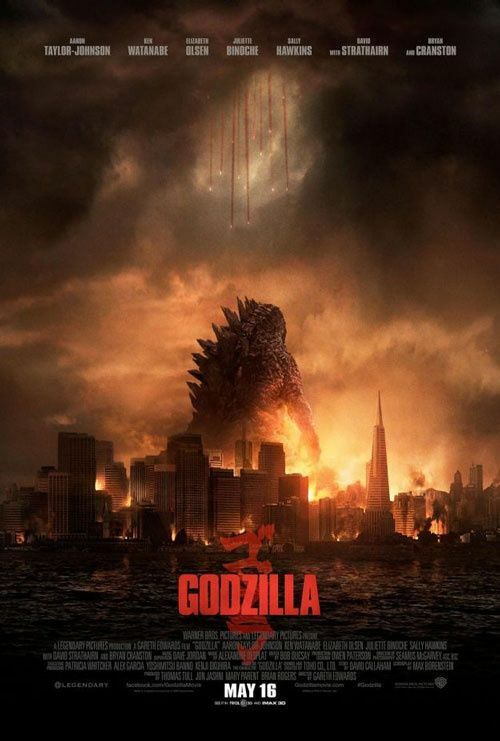 To demonstrate that lessons were learned with the 1998 adaptation, Legendary Pictures and Warner Bros. released a theatrical poster with their Godzilla, looking like an update on the classic instead of a rebuild. The adaptations starts with a montage of classified files, a mix of actual historical footage from the atomic tests and film from the fictional group, Monarch, implying that the testing at Bikini Atoll was to destroy a giant monster, code named “Godzilla”. The film then picks up in the Philippines in 1999 as scientists converge on a pit mine collapse. The bottom of the mine fell into a cavern. Exploring the cave, the scientists, led by Ishiro Serizawa, played by Ken Watanabe, find fossils and two large spore-like objects. One is dormant, possibly dead. The other, though, has broken open. A trail from the cavern, burrowing to the surface, leads to the ocean. In Japan, at the Janjira Nuclear Power Plant, seismic sensors start going off, each event larger than the previous. The plant prepares for a massive earthquake, but Joe Brody thinks the seismic readings are something else. By the time the order to shut down the reactor is given, it’s too late. The reactor enters meltdown. In the depths of the reactor, Joe’s wife, Sandra was leading a team of technicians to try to shut the reactor down gracefully when the reactor core is breached. Sandra’s team is unable to escape and is trapped when access to the core has to be shut to prevent a new Chernobyl. Fifteen years later, US Navy Lieutenant Ford Brody, son of Joe and Sandra, returns from the Middle East to his family in San Francisco. After the joyous reunion, Ford receives a call from the American consulate in Japan, informing him that his father has been arrested for violating the Janjira quarantine zone. Ford flies to Tokyo to bail his father out. Since Sandra’s death, Joe has been convinced that the cause of the reactor breech and meltdown was something other than an earthquake. His proof, in the form of disks and papers, lies in his old home inside the quarantine zone. Joe convinces Ford to go with him into the zone. Inside the quarantine zone, nature is well on its way to retaking the abandoned city. Plants overgrow cars and houses. Two dogs run past Joe and Ford. Joe checks his Geiger counter; there’s no appreciable radiation, contrary to official reports. Joe removes his breathing mask and promptly fails to die an agonizing death. At their old home, Joe recovers his proof, in time for him and his son to be arrested again. Instead of going to jail, the Brodies are taken to the power plant. Monarch scientists, including Serizawa, are on site. Serizawa compares the seismic readings he’s getting from the plant with the results Joe has, confirming one of the scientist’s suspicions. With the increased seismic activity, the secret kept within the Janjira facility emerges from the reactor core. A giant monster, Massive Unidentified Terrestrial Organism or MUTO, crawls out, destroying its containment and causing havoc as it releases an electromagnetic pulse. The MUTO escapes, leaving Ford injured and Joe dying. In the aftermath, Ford is brought up to speed, including the Monarch information shown at the start of the movie and the existence of a monster, Gojira, codenamed Godzilla, that the atomic bomb testing was meant to destroy. The MUTO had caused the mine collapse in 1999 and had burrowed its way to the Janjira plant, where it chrysalides and fed off the radiation from the reactor core. Serizawa postulates that both Gojira and the MUTO were from a previous age where the radiation levels were much higher. With the use of atomic energy since the middle of the Twentieth Century, the MUTO was awakened and attracted by the Janjira Nuclear Power Plant. Ford explains his father’s findings, that Joe believed that the odd seismic readings were a form of echolocation, sending a ping of sorts, and receiving an answer. The US Navy, taking over from Monarch, tracks the MUTO to Hawaii. The problem the Navy is having stems from the EMP disruption the MUTO puts out. Too close, and all electronic circuits get fried. It makes locating the MUTO difficult. What does help is the loss of a Russian submarine whose beacon is picked up off Hawaii. Ford is sent off the aircraft carrier to go home when the carrier is fifty kilometres off-shore from Honolulu. A special forces team is sent to recover the Russian beacon on one of the islands. 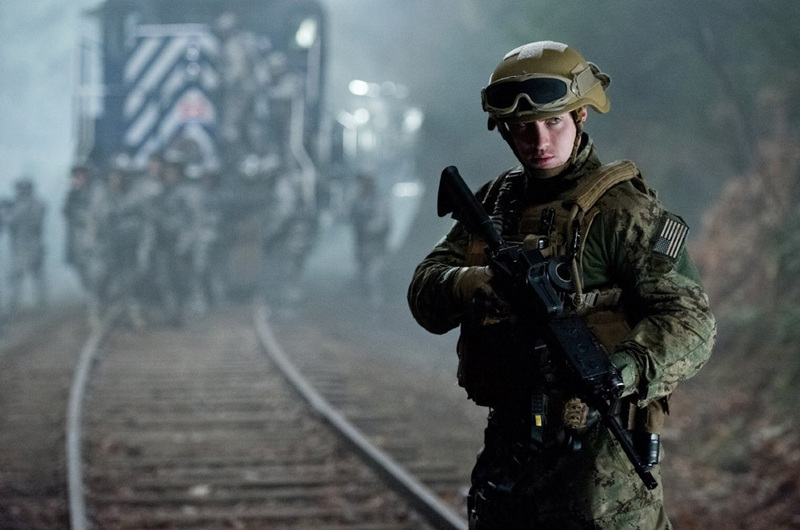 The team, instead, finds the sub in the middle of the island’s jungle, along with the MUTO chewing on the sub’s nuclear reactor. A new object appears on the carrier’s sonar. Its arrival in Hawaii is preceded by a tsunami, flooding the streets of Honolulu. The Navy engages the MUTO, but it sends out an EMP burst that not only disables fighter jets but shuts down Honolulu. The second contact swims into visual range and under of the US fleet. The alpha predator himself has arrived – Godzilla. American troops try shooting Godzilla after he makes landfall, doing less damage than a mosquito does to a human. The fight in Honolulu between Godzilla and the MUTO is short and indecisive, with the MUTO flying away. The destruction in their wake, though, is on the scale of major earthquakes. Ford finds an US Army unit to hook up with. Godzilla returns to swimming after the MUTO, now with the US fleet as escorts. A third contact is detected in the western US. A question comes up, why would the MUTO call Godzilla if the latter is a predator. The answer is, the MUTO wasn’t. A check of the American nuclear waste storage in the deserts of Nevada discovers that what was once an underground vault is now open to the sky. A second MUTO, wingless but similar to the first, walks through Las Vegas, leaving more destruction. The difference in appearance leads Serizawa to hypothesize that the two MUTOs are the same species, just different sexes. The seismic activity was the mating call and return of the monsters. Tracking of both MUTOs and Godzilla shows a convergence in San Francisco. The movie builds up to the battle royale, Godzilla against the two MUTOs. At the same time, the movie remembers the human element. Godzilla and the MUTOs are treated as acts of nature, uncontrollable, unpredictable, and destructive. Through Serizawa, the idea of Godzilla as the defender of the Earth is brought up. While Godzilla is the defender, humanity isn’t necessarily considered to be part of the balance. It is human acts that awaken the MUTOs, the use of nuclear energy and the disposal of atomic waste attract the MUTOs. It is only when Godzilla steps in as a force of nature on his own are the MUTOs defeated. Viewers who want to see a monster versus monster battle will be disappointed in the movie. The conflict is built over time, giving the audience glimpses of what the fight will be like at the end. The filmmakers focus on the human element, the people affected by the destruction wrought. 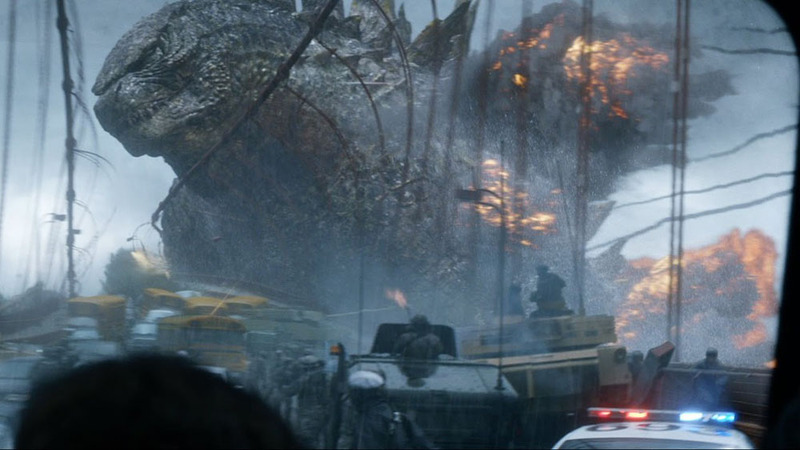 While Godzilla in the adaptation isn’t a symbol of the atomic bombs dropped on Hiroshima and Nagasaki, he is symbolic of the damage being done to the planet, of the extreme weather causing powerful storms that leave coastal cities and even some inland cities powerless. As an adaptation, the 2014 Godzilla calls back to the themes of the original Gojira, with the changes mentioned above. The filmmakers add touches throughout the movie, harkening to other Godzilla movies. The monster is referred to by Serizawa as Gojira, a TV news broadcast has the label “King of Monsters” below Godzilla as he swims back into the Pacific Ocean. Godzilla looked like Godzilla, and several scenes had him standing in iconic poses, including when he used his atomic breath. Just as important, Godzilla sounded like Godzilla; the improvement of sound effects augmented the monster’s voice. The MUTOs, created for the adaptation, still fit within the Godzilla mythos. Helping the adaptation is the avoidance of having the story set solely in the US. The movie acknowledges the Japanese heritage of Godzilla, setting the first portion of the film in Japan. Both Hawaii and San Francisco have large Japanese populations. Care was taken to keep Godzilla in a heroic mold, even with the swath of destruction he left behind. The biggest drawback, if it can be called such, is how long it takes to get a good view of the star attraction. The movie acts as an origin story, introducing the audience to the director’s vision of Godzilla. While success of a movie isn’t indicative of the success of adapting**, the age of the character, sixty years old as of 2014, is key in whether the audience accepts or disdains an adaptation. In the case of the 2014 Godzilla, audiences accepted the character in the movie and, indeed, the movie itself, making the adaptation popular enough to justify a sequel. The movie wasn’t written with a sequel hook, but Legendary Pictures has licensed several more characters from Toho, including King Ghidorah and Rodan. Next week, Jack the Giant Slayer. * GINO – Godzilla In Name Only. ** See also, Scott Pilgrim vs the World.